Troy, Ohio (April 2, 1960) - A 41-year-old Detroit woman, Vicki Wood, describes herself as a "typical housewife, mother "and grandmother." But she has to admit people look as though they don't believe her when she talks about being a grandmother - especially when they know she's an automobile racer who has won more than 30 trophies as a woman's national stock car record holder. Now the lively, youthful-looking career grandmother is going to try to win another race - entering a field of competition that's completely foreign to her, but which doesn't faze her in the least. She has joined the other drivers who are testing the economy of 1960 automobiles April 2 to 6 in the 2,000-plus mile Los Angeles to Minneapolis trek. A top winner on the nation's asphalt, dirt and sand tracks, Vicki Woods says that she's looking forward to the economy run with the eagerness of a school girl going to her first prom. 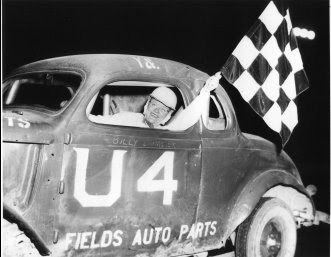 The car racing grandmother says she had never been close to a race car or thought of driving one until she was sitting in the grandstands at Motor City Speedway in Detroit one August evening in 1953. Seems she didn't think much of the races, and told her ex-race driver husband, C.E. "Skeeter" Wood so. In fact, she made a remark to the effect that she thought some of the drivers were so bad they shouldn't even be out there. And she added, "I could do a better job than they're doing." Her husband took her up on it, and made arrangements for Vicki to drive in the powder puff race the following week. She surprised him - and herself - by finishing ninth out of 20 women drivers. From that time on the tiny blonde Detroit racer appeared in numerous races. She won her first race on a dirt track in Mt. Clemens, Michigan. Then she went on to win five consecutive powder puff races on an asphalt track at Flat Rock, Michigan. It was during the final race that she had one of her few accidents. The car following her caught her rear bumper, flipping her car up over the retaining wall and into wire netting. Landing back on the radiator she flipped over several times and was then taken to the hospital – shaken up and bruised. While she loves racing, Vicki Wood doesn't let it interfere with her home life. She still finds time to do her own housework, make most of her own clothes, and iron her husband’s shirts.